Summer is here, and with the longer, warmer days comes the desire to spend time outside, out of the city, surrounded by green. Looking to inspire in that direction is the 12th edition of The Garden Show and Spring Festival, launched Tuesday at the Beirut Hippodrome. Nestled under the shade of rare Beiruti trees, just a short walk through bright copper mud is a little oasis of calm in the city, where this year’s 220 exhibitors have set up shops. From landscapers who have created sample gardens, to a Tripoli basket weaver, this year’s show is full of local handicrafts, designers and more. The show is also hosting 60 exhibitors under the banner “Travel Lebanon,” geared at offering visitors a chance to discover those parts of Lebanon, awash with culture and heritage, but off the well-beaten track. 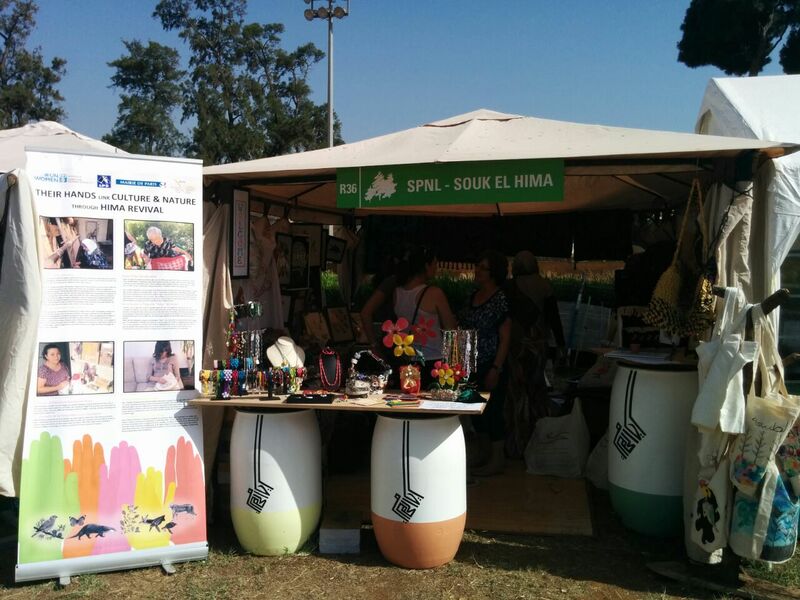 SPNL’s “Souk Al-Hima” took part in the Garden Show’s Travel Lebanon section from 26-30 May, 2015, with the support of UN Women Fund for Gender Equality and the European Union (EU). 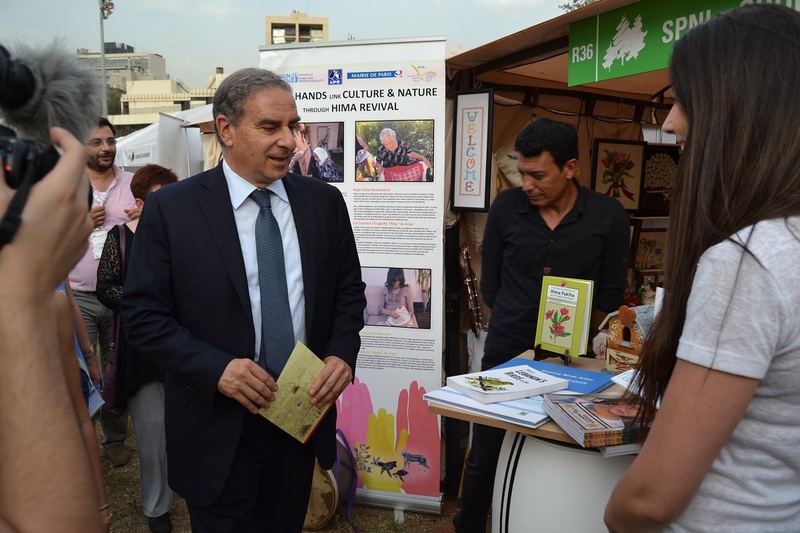 Souk Al-Hima is a new program established by SPNL aiming to conserve cultural and traditional skills at local communities and to upgrade the livelihood of rural communities within IBAs/Himas in Lebanon interlinked with natural resources. Through organizing an interactive stand, SPNL displayed products from several Himas: Armenian needle work and handicrafts from Hima Anjar, carpet weaving from Hima Al Fekha, accessories from recycled material (upcycling) from Hima Qoleileh/Mansouri, and traditional musical instruments from Hima Kherbet Qanafar. Approximately two participants participated from each site so they can explain and sell their products to customers, thus enhancing their communication and marketing skills. Furthermore, SPNL exhibited some of their publications and presented spectators with the SPNL 30 years’ magazine. This contribution was aimed to communicate SPNL’s message of revival of Hima for women empowerment to the public and to market the efforts of these women through promoting Lebanese nature and culture. The “Garden Show and Spring Festival” is an annual spring event that has been taking place in Beirut for 12 years. The theme this year – happy summer days at the mountain house – has inspired exhibitors to display everything you could possibly need to transform your outdoor space into a summer getaway; from the landscaped gardens with experts on hand to advise, to garden furniture, terrace designs, slightly odd vegetable sculptures, gnomes, BBQs and, of course, plants of all shapes and sizes. The festival witnesses about 24,000 annual visitors from various demographics. Moreover, the event aims to promote the Lebanese outdoors way of life through multiple exhibitors and entertainers from around the country that encourage green concepts, nature preservation, and Lebanese heritage. The Garden Show and Spring Festival is held alongside Travel Lebanon, the first initiative aimed to enhance rural tourism in Lebanon in order to contribute to Lebanon’s economic growth, encourage investments, and create job opportunities in rural areas, particularly for women and youth.